On the anniversary of Srila Prabhupada's appearance, Hare Krishna centers worldwide hold a festival in his honor, called Vyasa Puja. Many centers hold additional special events. Srila Prabhupada Festival in Los Angeles. Held on Memorial Day weekend (towards the end of May) at the New Dwaraka community, this two-day festival includes a reunion of disciples and a Harinama procession in downtown Santa Monica. The ISKCON of New Dwaraka temple was Srila Prabhupada's headquarters in the West for many years, and his rooms here are carefully preserved as a shrine for visitors. 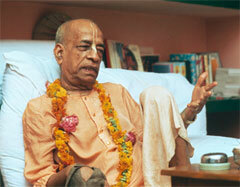 Also featured is Srila Prabhupada's garden, where he often sat and conversed with dignitaries and disciples. E-mail info@prabhupadafestival.com or call (310) 815-9393. Or visit www.prabhupadafestival.com. Prabhupada Family Reunion at 26 2nd Avenue, New York City. Held annually during the first weekend in June on the day after the New York Rathayatra, at the site of Srila Prabhupada's first temple in America. For details, call (212) 420-1130. E-mail: dayananda@msn.com. Website: www.krishnanyc.com. Prabhupada Family Reunion Festival at New Govardhana, Australia. Held during the Christmas to New Year's holidays, at the New Govardhana Farm near Murwillumbah, NSW. 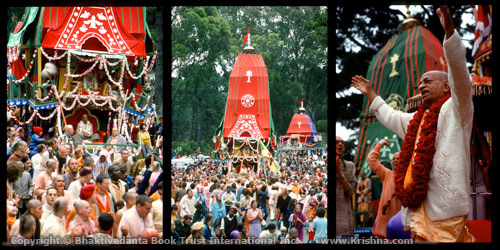 Devotees from all over Australasia attend the festival, which includes seminars, theatrical performances, reminiscences, and the Rathayatra, or Festival of Chariots, on the beach at Byron Bay. There's also a bonus Rathayatra, when Lord Jagannatha joins the Byron Bay New Year's Eve parade, encircled by hundreds of Hare Krishna chanters, crowds of dazzled onlookers, fire-breathing entertainers, and didgereedoo players. Please contact New Govardhana Farm, P.O. Box 685, Murwillumbah, NSW 2484, Australia. Phone: +61 (02) 6672-6579. Fax: +61 (02) 6672-5498. If you know of other Prabhupada Festivals not mentioned here, or if you have a correction or update for the above, please contact us.